More offline rpg ideas to help build a group. You will need two Alexa Dot Devices. Leave them on the default wake word. Using the DROP IN Feature and one ALEXA on Mute you can then have crews ask the “Computer” for information. The GM can then unMUTE the other ALEXA and respond to questions as needed. It also allows for room to room communications with GM as needed. These are great ideas and leads, Jake Ryker! I often wish I had a really futuristic Roomba to keep my bridge tidy. Hopefully others will contribute and it will grow. Keeping the default wake word of Alexa you can use the term “Ensign Alexa” to wake Alexa. You can then use Alexa Blueprints to customize it for your game. 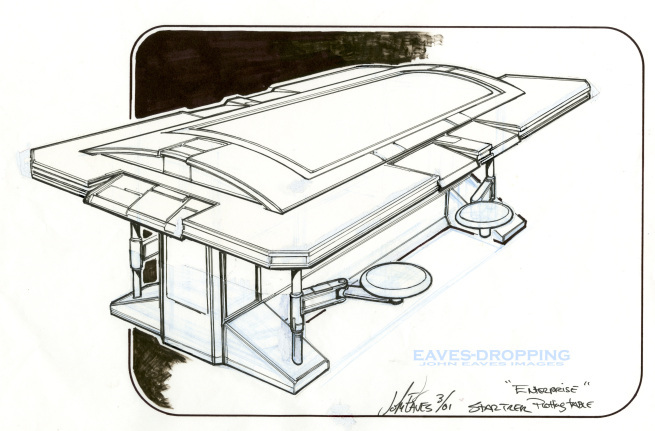 These easy to use blueprints are really the simplest way to program. All you do is write in plain English the question and answers and Alexa repeats them once asked. It really is that simple. The templates are fill in the blanks programming. So, how could this be used for RPG – Well, after Alexa is established as a member of the crew you might do something like this. Communications receives fragmented message with the only words “Sector 2 Command” and “Ion Cannon”. 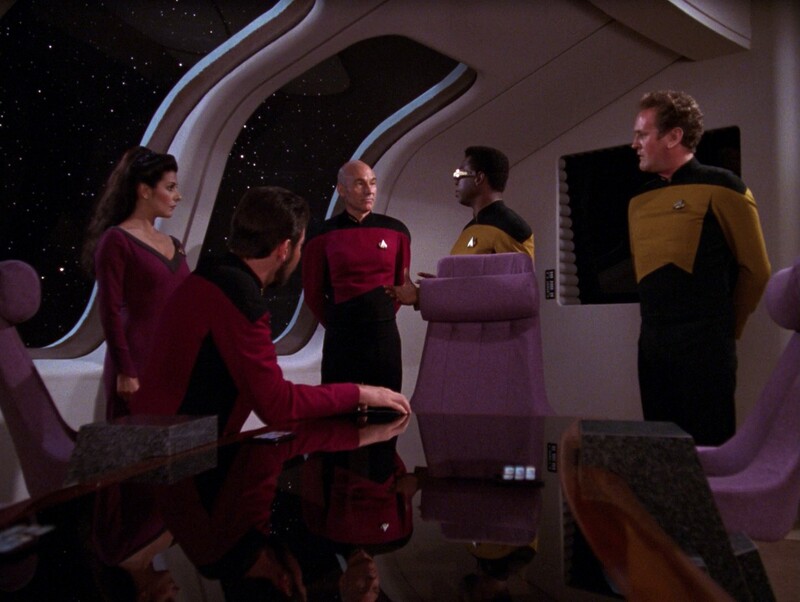 Players could then ask Ensign Alexa about Sector 2 Command and or Ion Cannon and get information that the GM has previously set up. Alexa Blueprints can remain private to you and your Alexa only unless you want to publish them for others to use. 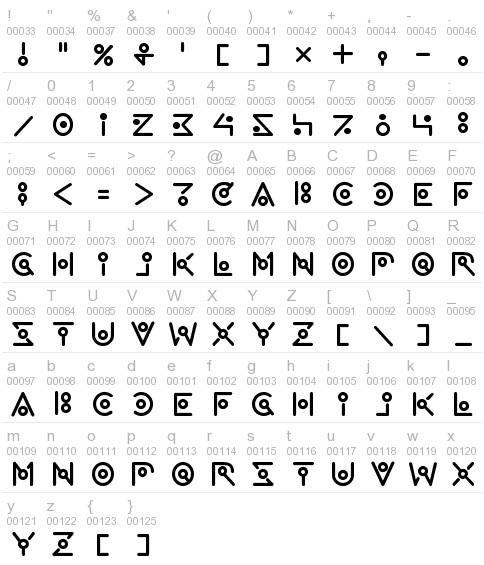 You can use strange alien like fonts to write messages or to make pages in a journal for players to decipher and learn information. Here is a link http://www.abstractfonts.com/font/13050 I chose this link and font at random remember copyright laws. Now you can make these in advance and have them picked up in debris or sent aboard as part of a mission briefing. These can add some tactile experience to the game. It is cheap and can sometimes lead to bad translations with unintended consequences. You can also find fonts that look like a signature which are helpful for writing fake reports or orders and then signing them. The small things can add so much to feel of a game. I have often been in search of an Instant Message program that would allow custom fonts. That way a universal translator could be created. The player would get messages in a font and would have to manually decipher them until they were able to get the font as a key and would then translate all into English automatically. While deciphering them you could plug in letters they had already translated so they would over time lighten the manual translation load. But I have yet to find such a program. Those are great ideas, Jake Ryker! This work has Thom's blessing as canonical. We have used the alphabets and some words & sentences in Armada I, Armada II, and Armada III role playing and LARPing missions. At Armada IV we even had signage for things like registration, restrooms, and bar menus for Arvonian, Kralien, and Ximni customers. There is a space on the bridge or located near the bridge that can be used to incorporate a huge leap forward for LARPing or RPG elements. 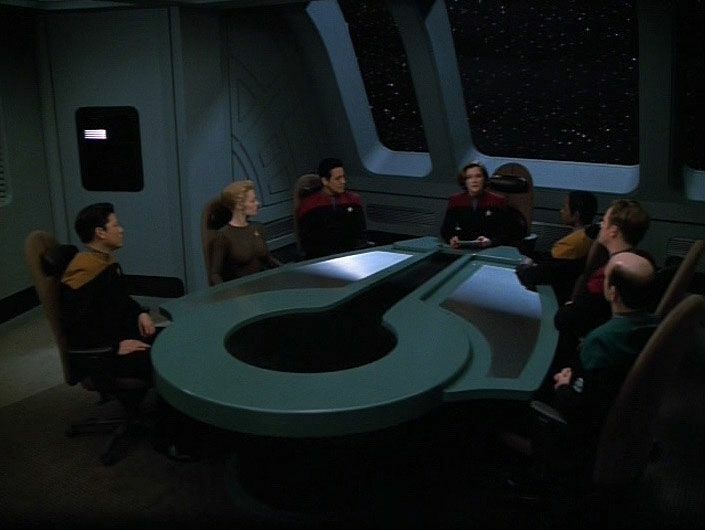 The conference room or plotting room is a great place to use for mission briefings, away missions, and conferences on strategy with senior officers and the list goes on. 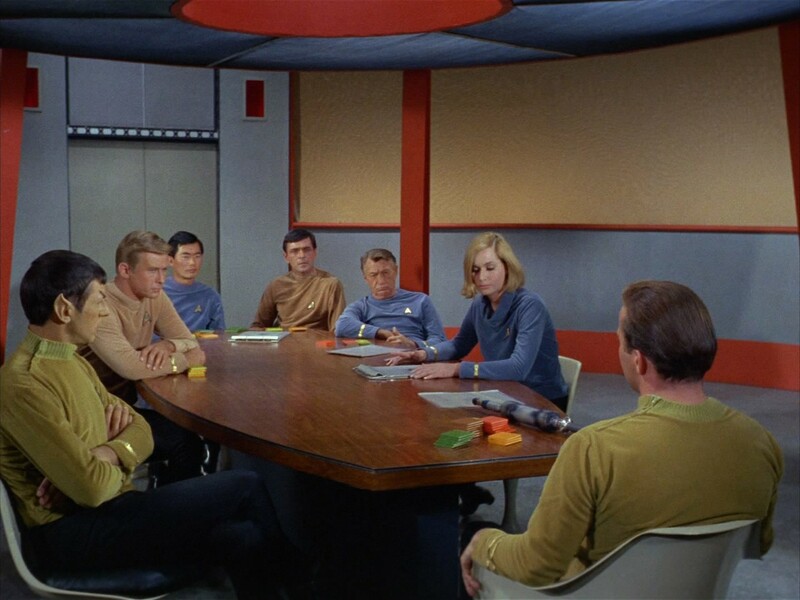 In each of the Star Trek shows they used a room to provide them the opportunity to transition from action to another portion of the story's action. Setting this area or including this area within a bridge set-up can mean the difference between strictly combat on bridge action and greater story development. It can also allow for others to take the Conn… or to order the Captain to the Bridge. Actions that otherwise would not happen. 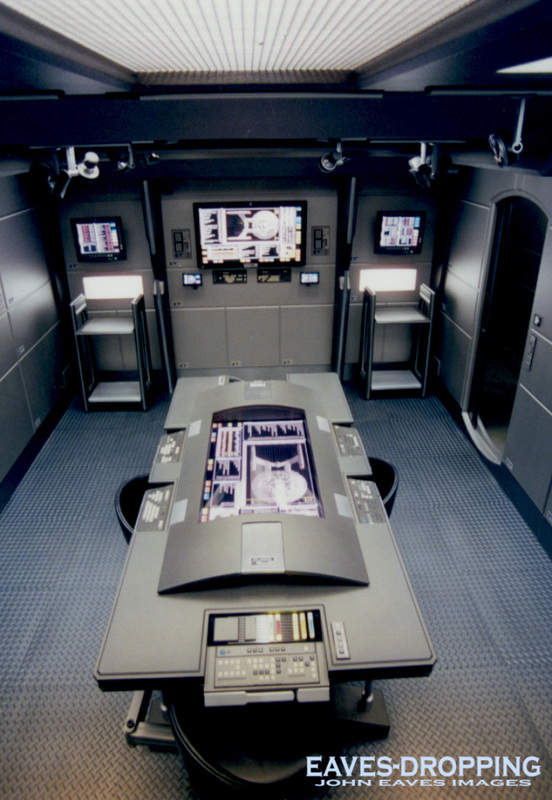 Here are some photos of various ship conference rooms or plotting room. I personally prefer the one from Enterprise as it is close to the bridge and nearest the action. You can set this up in one of two ways. The first is a simple table with chairs and using printed maps of the region of space for discussion. Other paper props such as crew service records, and mission details could also be passed around the table. The second way is to use a computer monitor or TV screen built into a table and then display information here for conversations to be held. Again paper props can still be used for things other than maps. It does not really matter which way as long as you can gain the most from the LARP / RPG experience. Jake Ryker, that robot is amazing! My wife is in a wheelchair so I will probably be one of the first to buy one when it is available! As I mentioned before using Chromecast can allow you to cast photos to a TV for the purposes of mission briefings. Like Sector maps, or other information. You can also, use it to Role Play a particular part of the story. A RPG Example - GM Casts photo of fortress on a planet that team is going to try an infiltrate. As the players work there way through the castle, the GM then casts floor plans or layouts to complete the mission. Here is a video of how casting to a chromecast works for those who have never used one. Old school pen and paper RPG / Miniature game resources can often provide ideas for mission, scenarios, and other cool elements. Here is a list of some old school games.